This Config Layout has set specific binds to work properly. If you set your preferred key binds, make sure the changes you make follow the next instructions. While you are on Build Mode, you can use the default mappings for your builds (Left Mouse Button = Wall, Right Mouse Button for Stair, etc) but if you want to use an optional set of keys for Wall, Floor, Stair, Roof. Fire (Wall), Next Weapon(Floor), ADS(Stair), Prev Weapon(Roof). I recommend let the Left Mouse Button set on Fire in the Primary, so you can edit your builds by left clicking. Heads up: Avoid duplicate key binds on your Primary,. e.g. E for Next Weapon on Primary and E as ADS (stairs on the Secondary). Having a Build Mode Sub-Config allows you to set different XIM sensitivity while on this mode, for faster movement and turns. I use a Ballistic Curve, to do full 360 turns in a short swipe, great for create a four wall box with a single movement. <<< XIM APEX END COPY <<<If you find the curve too aggressive, lower your Build Mode Sub-Config sensitivity or try a different curve. My build mode sensitivity is 35% less than HIP when I use this curve. If you are asking: Why is a Inventory Sub-Config? is for exit inventory by pressing the build button, otherwise can mess things up (enter Build Mode sub-config, instead of get back to HIP controls). UPDATE Video Tutorial Added. I recommend to follow the tutorial and create your Expert Config from zero. Just letting you know the XIM4 and XIM Apex codes at the top are in the wrong order! Re: [Fortnite] Enhanced Config Layout: Custom Build Keys and Build Sensitivity. Great work! Appreciate all the effort. I tried a building aux before and it always got messy. My question, you build with holding keys on the keyboard? 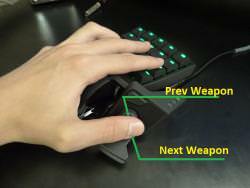 Instead of holding mouse buttons? You find it convenient losing one movement finger in the heat of a build fight? You use f1 f2 f3 f4 to build? By holding those keys down? It says you can change the keybinds for F1-F4 as you like. I will give this a try when I get home and see how it goes! Nothing to lose. 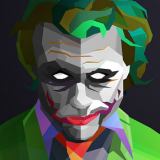 Very nice guide/tutorial and fancy forum formatting. That's right, the F1-F4 keys are preset on the Config as a template, are not fixed you can change it for whatever keys you want, those are the defaults on PC. Some players prefer use the ZXCT (Myth) or QEFC, etc. 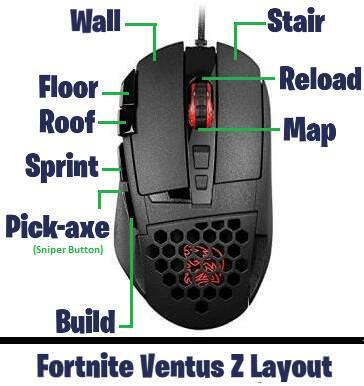 Ventus Z DPI buttons (two buttons next to Left Mouse Button) have a edge and its activation is by sliding the finger not pressing unlike G502 or G402. Looking forward to trying this when i get off work. So to change the sensitivity of HIP is still under HIP and ADS sens is under ADS? Yeah that is pretty much there. The F1-F4 keys or custom keys are completely optional from the get-go build mode works with the default keybinds (left mouse button for wall, right mouse button, for stair etc). The custom keys are on the Secondary set of key binds... you can remove those if you want. I put F1, F2, F3, F4 on for an example and on purpose (nobody use those, and can't disrupt your controls) so you can use the original button mappiins if you want... I think those are the better, true power of Builder Pro. I run this config for the ability of have a custom sensitivity on Build Mode ... help me a lot because I'm low sensitivity player and building a box of 4 walls is not that easy due the turn limit, and that curve makes wonders for me. Whoa. Great work on this post!! I’ve only tested out this before once trying my own ideas and stuff. Lol didn’t work out for me too well, but now that you’ve created this great tutorial / config I’m definitely gonna try it. Because who wouldn’t want more sensitivity while building. Forgot to ask. I have to enter build mode before selecting the piece? can you do one button building with this setup? Nop just normal toggle build mode building... for one button building, you "need" scripts. 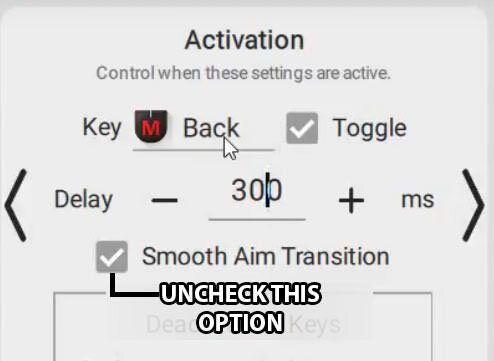 This only a offers you an optional mapping for your builds keys with XIM Manager and custom sensitivity while on build mode.